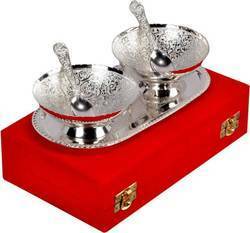 Leading Manufacturer of white metal tulsi plant and wedding gift bowl set from Jaipur. 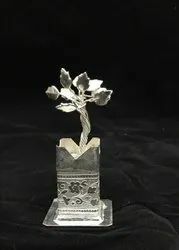 We are manufacturing White Metal Tulsi Plant in Silver Finishing. Return Gifts, Wedding Gifts, Silver Gold Plated Brass Flower Shape Bowl. Wedding is an occasion, which is remembered and discussed for long, These Return Gifts are best not only for the family members, but the friends and relatives also. These Return Gifts are given to the baratis by the bride’s as well as Groom's family. And we makes it best choice for you.